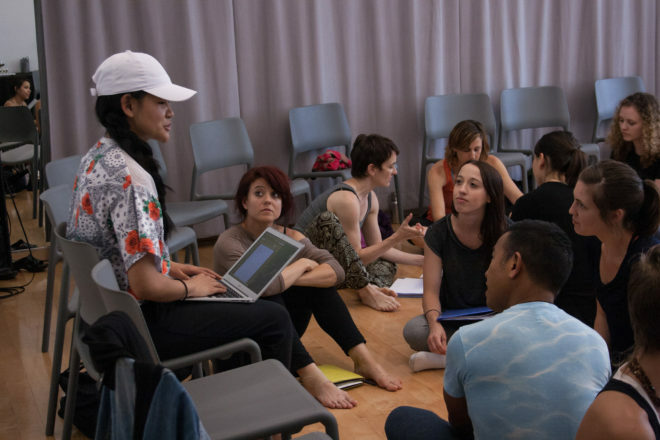 The DEEP Cohort, presented in partnership with The Actors Fund, engages a group of artists who are actively invested in advancing their creative careers, and seeking to deepen their administrative skill sets. The group will meet separately before and after each of the four Spring 2019 DEEP sessions, in a safe, confidential, and supportive environment, to share insights and draw from each other’s experience. The goal is to encourage accountability to the group in terms of each participant’s individual artistic development as well as administrative progress. In a field where artists are often “competing” for the same funding and opportunities, the cohort will serve as a counter-balance; a space to build unity and soften the impact of working in isolation artists often experience. In addition, the cohort will learn alongside one another from the guests and industry experts the DEEP sessions provide; creating a lasting community of practice and peer support. Who should apply to the DEEP Cohort? The DEEP Cohort is designed for professional dance artists and choreographers. Participants should have some knowledge in the subjects of marketing, time management, financial literacy, career trajectory and fundraising tools, and want to expand their professional toolbox in order to enhance their artistic practice. Facilitators will be career management specialists from The Actors Fund. Selected participants must be able to attend all the meetings and workshops. Cohort participants will meet from 6:30 – 7:00 pm, then engage in an open workshop from 7:00 – 8:00 pm with a follow-up conversation from 8:00 – 8:30 pm with the cohort group only. The application for Spring 2019 is now closed. Thank you for your interest.